For some reason, I’ve been talking recently to people about what we heard from health officials and senior medics over the past years in relation to the treatment of persons with severe acquired brain injuries, in the USA, Ireland, and Germany. And I think it’s worth looking at them again. Because now, we know much more. We know how Pádraig is doing after two years of good care and therapy. Note: Just read the above again. Slowly. There are two really remarkable points about the above. (1) Even people in the Irish health sector working with persons with disorder of consciousness do not believe me when I tell them that this is the view of some leading consultants and health officials in the country. (2) Although Pádraig *is* one of the people who, according to this view, does *not* offer a good return of investment because he is one of “These are individuals who will never get to that point” of increasing their functionality or going home or have their care costs reduced — he *has* increased his functionality (e.g. only eating orally), he *has* gone home, and he *has* decreased care costs by at least 18,000 euro a month (“just” by the removal of his tracheostomy because of our ongoing insistence and care; and there is more). He has done all this because he had huge support and got good care: he is not on any medication, does not have dropped feet, takes food only orally, has no catheter (and no urinary infections), has great skin and no bed sores (apart from those he got in Beaumont), and he has no other injuries or bugs. It looks like he defied all medical knowledge, judgement and expertise. And to me, it looks like as if Pádraig’s live will fundamentally change the way the experts think about persons with severe acquired brain injury. It will fundamentally change the way they think, they talk, and they treat persons with severe ABI. Back in Germany and at REHACare for a few days. 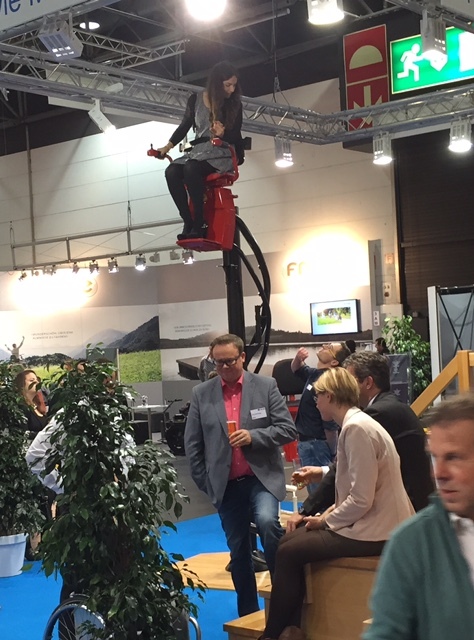 People in wheelchairs pulling themselves and their wheelchair up to the top of the exhibition hall. Lifts lifting people up to any height desired. Thousands of people talking and living integration. Every imaginable help and support for any imaginable need. And another fresh look at the German media, reporting on hundreds and thousands of refugees moving across the Austrian border into Germany via a small country road and Mr Putin literally going on the attack. I met our friends from Pforzheim who introduced me to some of their contacts running different kind of care houses for persons with severe acquired brain injuries, leading to extremely interesting conversations and allowing me to continue my amazing learning experience about all the things that are possible! And that’s the way it is. Amen. Check this out – a brilliant account of what got Pádraig to where he is today: Pádraig le Marcus Mac Conghail by IMLÉ.